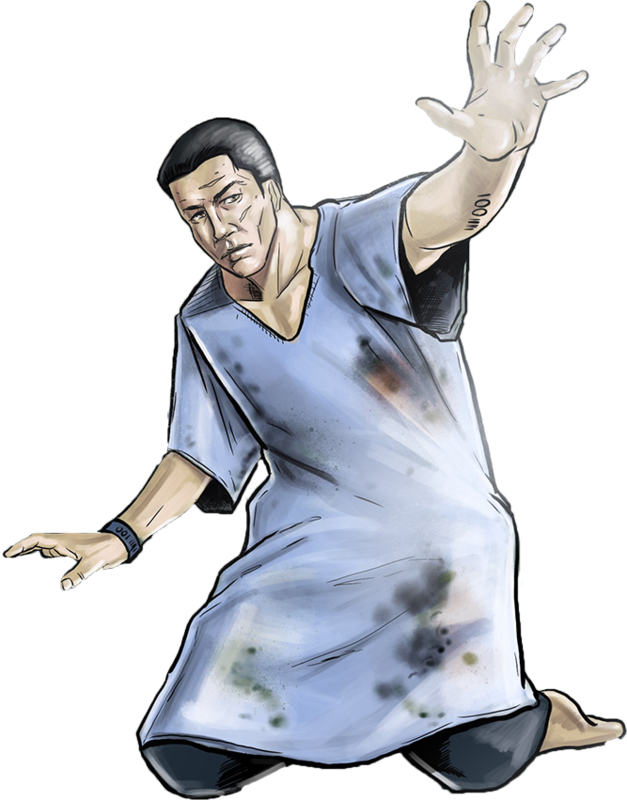 Patient Infinity is known to be an incredibly powerful hyper-cog with vast telepathic and telekinetic abilities. The full extent and breadth of his powers are unknown. There was was once a boy who always stayed to himself. In elementary school at recess he sat in the corner of the parking lot. In high school, he ate lunch by himself everyday. In college, he always studied in the same remote spot inside the Platinum City University library. Then, when he graduated, he worked from home as a telesales representative. Even though he was greatly over-qualified for the position, it offered him the option of keeping away from everyone as he was not forced to be in an office with people; being in classes with his peers all those years was more human interaction than he ever wanted. He excelled at the job; always knowing what to say and how to say it in order to get people to buy. His close rate was 97%, only missing those who had absolutely no money to buy food or pay rent, let alone the goods and services he was selling. Thus, he lived comfortably. His bills were always paid months in advance, and he never had a need in the world. That was until he was discovered to be a powerful telepath and telekinetic. You see, the man was using his powers to convince the people he called to buy. And it worked almost every time. However, one day while making the few phone calls needed to hit his quota, the man happened to reach another telepath. When he tried to use his gifts to persuade the customer, the individual on the other end of the line knew it and immediately reported the man to management. It was not long before the company fired the man, as it was highly illegal for companies to hire telepaths or people with mental powers to work for them in sales or consultant roles. It created an unfair advantage for the company if the powered individual used their abilities against unwilling customers. So, considering the incredible amount of sales the man had made over a lengthy amount of time, the violation by the company was quite egregious. Thus, they were brought before the FTC on charges of using unfair and unscrupulous business practices. As a result, the business was closed permanently and they were hit with heavy fines. The man was also in deep trouble. It came to light that since graduating college, he had been using fake names and social security numbers so nobody would know his true identity if he were ever exposed. When the information would not clear during an interview process or while making a large purchase, he would use his powers to make the person take him to the decision maker, and once in front of them, he would use his powers again to make them finalize the decision regardless of protocol. When news of this hit the local media outlets in Albuquerque, NM, his most recent fake name spread like wildfire. This ultimately caught the attention of Reina Valencia, the CEO of Universal Intelligence. The company had already been kidnapping telepaths for years, and she demanded they capture the man for the purposes of using his brain cells in development of new artificial intelligence based technology. Alas, he was tracked down, shot with a tranquilizer, and locked in an Ebb Cell inside UI’s detention compound with all the other telepaths and people with mental powers that had been captured. For years, they experimented on the man, naming him “Patient Infinity” as the possibilities with using his high powered cells seemed endless. They did not know his real name, where he was from, nor did they care. All that mattered to them was the man was one of the most powerful hyper-cognitive telepaths they’d ever captured, and his brain cells were key in developing some incredible advancements in their technology. However, when UI’s owner, Edgar Lockhart was brought down and exposed for being the criminal mega-villain he was, the tech company barely made it out unscathed. Fortunately for them, they were able to cover up their illegal activities and survive the ensuing investigations, but their bottomline took an enormous hit. Their saving grace was the controversial Project INTEL. When Barbara York, COO of Universal Intelligence, was able to negotiate a deal with Knox Hyde to secure the INTEL government contract, she also landed them all future government contracts UI would be a viable candidate for. This brought their revenue back into the black, and everything was back on track for them. As they mass produced intellicaps, the devices at the center of Project INTEL used to monitor and control the mind of geniuses in order to prevent the rise of another Edgar Lockhart type mega-villain, UI knew they had to do more than just provide the unit number required. They had to improve the intellicaps so Knox Hyde and the US government would be impressed and become more dependent on their technology. Therefore, Barbara York dug deep into their remaining cache of telepaths and went to old faithful. She made Patient Zero an active test subject again. This time, though, she made sure they did not have a repeat of a recent mutiny attempt lead by one of their most talented employees, Dr. Logan Hunt. She tapped UI’s most seasoned and trusted scientist for the experiment, Dr. Demarco Scienza. Dr. Scienza was able to successfully extract Patient Zero’s brain cells and implement them into the infrastructure of the intellicaps. This greatly increased the power and efficiency of the intellicaps, and even enhanced them to the point that they could be updated and controlled remotely. It was Patient Infinity that made this possible. Yet, he did not even know it, for the man was in a completely comatose state most of the time. Knox Hyde, nevertheless, thanked the man by high-fiving the glass of his hyper-inhibiting Ebb Cell on his last visit before leaving to report back to President Enid Remington that INTEL was way ahead of schedule and much better than they ever imagined.